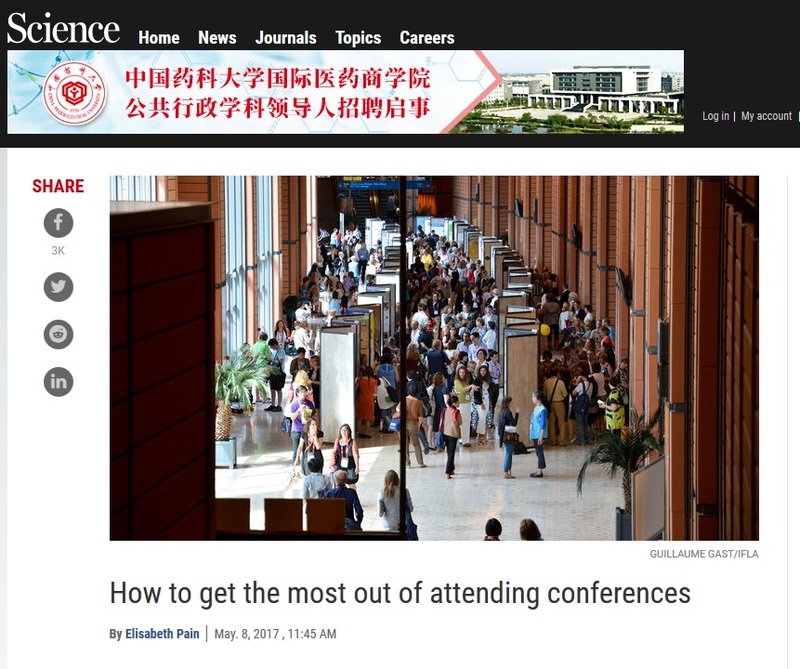 I came across this nice article in Science by Elizabeth Pain which is full of suggestions on how to make the most of a conference/meeting. Click here to go to the site direct. The Company of Biologists Conference Travel Grants (N.B. They also offer Travelling Fellowships for collaborative visits to another lab). The Royal Society of Biology offers two types of travel grant of £500 every year to members worldwide one for student Affiliates and the other for Early Career members. British Society for Cell Biology - these are sponsored by the Company of Biologists and they provide financial support for BSCB members at the beginning of their research careers to attend meetings and courses. Awards will be up to £400 for travel within the UK (except for BSCB Spring Meeting for which the full registration and accommodation costs will be made), up to £500 for travel within European and up to £750 for meetings and courses in the rest of the world. The British Pharmacological Society allows members to apply for a bursary to attend or present at pharmacology related events. It can also help cover caring costs associated with attending their meetings and events. Nature Research offers travel grants to three promising researchers per year travel to an international scientific meeting of their choice that they would otherwise have not been able to attend due to a lack of funds. Three grants, each of €2,500, are available to to early career scientists whose research is focused upon one of the three subject areas covered by the journals (Biology, Chemistry, Physics). Bio-Techne offer a monthly travel grant to the meeting of your choice - you apply by filling out a survey and at the end of each month they select 1 recipient for a $1000 travel grant. BSDB - British Society for Developmental Biology - BSDB Conference Grants are available to cover registration and accommodation costs to attend BSDB-sponsored meetings. They are open to all BSDB members. Boehringer Ingelheim Fonds awards Travel Grants to junior researchers who are currently conducting an experimental project in basic biomedical research and wish to pursue a short-term research stay or attend a practical course of up to 3 months. Society for Reproduction and Fertility - SRF members are eligible to apply to the Society for financial support to attend conferences and meetings relevant to the fields of reproductive biology and fertility. EMBO has a number of funding opportunities for young scientists that include lab visits and travel grants. eLIFE - if you’ve authored/co-authored a paper here and a postdoc with up to five years of active research experience, you can apply for funding of up to $1,000 to support your costs of travelling to and participating in a conference. The Galton Institute provides funding (up to £6,000) for post docs in the field of genetics to travel for up to 6 months to learn a new technique not available in their current lab. The Leverhulme Trust has a grant for students to study or undertake research at a centre of learning in any country except the UK or USA (students receive a basic annual maintenance allowance of £21,000) and studentships are tenable for between 12 and 24 months. British Society for Immunology supports the travel costs for members who wish to attend meetings and congresses, both domestic and international; or, for example, those who wish to visit laboratories for specific short-term activities, such as collaborative research, or in order to learn new techniques. Society for Endocrinology have a fund for members attending endocrine meetings or conferences in which they have acceptance of an abstract. Members may apply for two Travel Grants per year: UK-based members may apply for a grant up to £600 to attend SfE BES and in addition, up to £750 for an overseas conference in Europe, or up to £850 for an overseas conference in the rest of the world.